I am testing out Comodo Endpoint Security Manager on my workgroup. CES Manager is installed on WIndows 7 Pro. Installation of the CES Manager was seamless and there were no issues. From what's in the log, ESM agent was installed with success. CES failed to install. Do you have any other third party security running on the Win 7 machine on which the installation failed? In case you do, please uninstall them and restart the system. Also use the the option to detect third party products and uninstall them during deployment. Please disable UAC and try again. Do you have the standalone CIS package installed on that system? Forgot to mention UAC is off for the windows 7 PC, Before the installation of ESM, comodo free AV had been installed but had been uninstalled before pushing the AV. update: I copied the installer from the temp directory and tried installing it manually, that seems to work. Have you copied and installed CES the msi version manually on the endpoint? Have you used the CES offline installer from ESM console-> Preferences->Packages? Does CES show as installed for that endpoint in the ESM console? Verify with the list view , tile view(should show a red square with a C in the tile of the endpoint), same for 3D view. I am sorry. I don't fully understand what you mean by 'to change CES function on the main console page to look like CIS Premium'. Initially after manually installing from the above, CES doesnt show as installed, i then used the console to 're-push' the package via wizard, and it is now shown as installed on the wizard. How to change the layout to where all the tabs are separated? What's the version that is shown for CIS Premium from the second print screen : More->About. 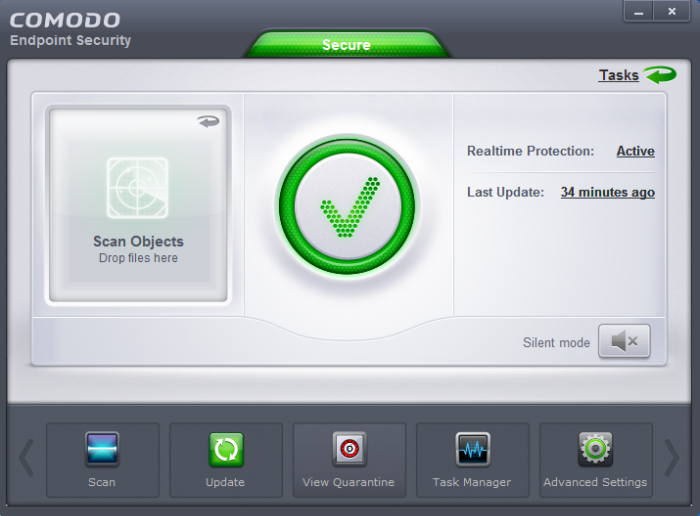 The first screenshot is of Comodo Endpoint Security (CES) , the product that is bundled with ESM. The second screenshot is of Comodo Internet Security (CIS) - an old one, perhaps v. 5.x. ESM cannot manage CIS only CES. Actually was hoping to get the console like CIS on the user's computer so that its easier to get firewall and defense+ information from the ces on the client pc itself. At the moment it is true that some of the functions are embedded, but its hard to tell at a glance what the Endpoint doing from the client pc. I will pass your comments on to the CES development team although most of the information you are looking for (such as the HIPS or Firewall modes are visible from ESM). We are building more reporting features into ESM so that, in the future, you will be able to drill down to the endpoint and get information on what it is doing. Sounds Great Michel, looking forward to that.